PROVIDENCE FORGE, VA -- There's no mistaking it -- when you're laying a foundation, you've got to go one brick at a time. It takes patience, perseverance and courage to keep working -- resting only on the notion that one day all the labor will pay off. But when you're standing there with an aching back, staring at a sizeable pile of unused building materials and a half completed project, it's hard to maintain perspective. The 10th hole at Brickshire -- a sharp dogleg left with a sloping fairway. Keep tee balls to the right. Photo Courtesy of Brickshire. You must press on, though, because laying a solid base is vital to any venture, be it constructing a bridge over a river or putting up a backyard tree-house for the kids. 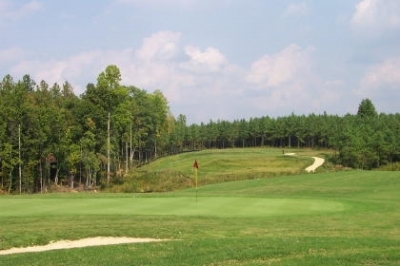 It's also imperative to a golf course -- and the concept was never truer than for The Golf Club at Brickshire, a two-year-old track about 25 minutes west of Williamsburg, adjacent to Colonial Downs and sharing its name with an equally new upscale housing development. Lucky for Brickshire Golf Club, it began its golf course life with all the building materials it'll need for a lasting pyramid of success. 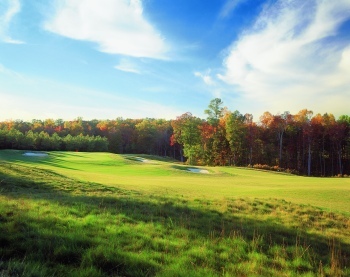 Start with an exceptional piece of ground in New Kent County -- right next door to The Tradition Golf Club at Royal New Kent (voted best new upscale public course in 1997 by Golf Digest), then add its location between Williamsburg and Richmond -- and you've got the potential for a real champion. Mix in the excellent design team of Ault, Clark & Associates' Tom Clark with design consultation by Virginia's finest, Curtis Strange, and it'd be hard to go wrong. This team was responsible for creating another Williamsburg area gem -- the Woods course at Kingsmill, as well as coordinating the remake of Portsmouth's Bide-A-Wee layout, amongst others. Teeing off at the 244 yard 15th hole, it looks like you're playing to the top of a mountain. One of the toughest par 3's anywhere. But even then, the quality of the layout was surprising. Clark and Strange are known for crafting courses with a tremendous dose of golf hole diversity as well as challenge, but Brickshire's varied property allowed them to take their philosophies to the fullest. 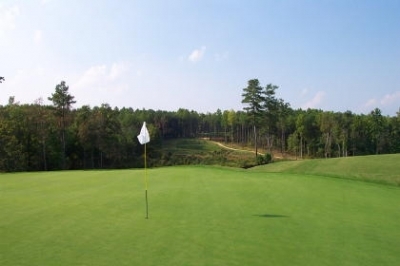 It's got all the swales and swirls of Royal New Kent, the mountainous quality of its other neighbor, The Tradition Golf Club at Stonehouse, and the playability of the Woods course at Kingsmill. In other words, there's a very solid foundation for success at Brickshire. And thankfully for your back, the building project is already complete. The course endured some growing pains early on, but the uneven spots aren't nearly as noticeable now. Tom Clark says there are still some areas to work on, but he's pleased with the overall look: "Curtis and I designed the course with the idea that the areas around the greens would be trimmed to fairway height, in order to add some excitement and playability for the average player. In this sense, it'll play a little bit like Augusta National -- and present several short game options for balls close to, but not on the putting surface. When those areas cut down, we'll really be where we want to be," Clark adds. Brickshire's 8th hole is 'only' 197 yards (par three), and represents a bit of a break from some of the lengthy holes on the course. 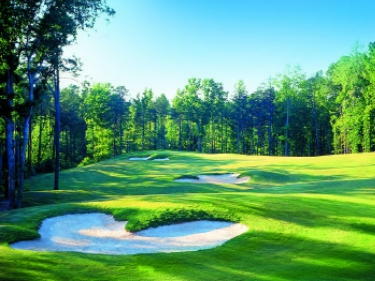 The layout's unique hole concepts would also seem to guarantee success, because Curtis Strange put four of his favorite legendary PGA Tour golf holes 'on' the course -- proven winners through the test of time, and tradition. Brickshire's first hole mirrors Augusta National's hole #3; #7 looks like Pinehurst #2's eleventh hole; #9 has the Scottish links feel of St. Andrews' #14 (with the infamous 'Hell Bunker') and #11 is set to play like the tenth at Riviera, a classic short par four if there ever was one. Looking to the course, it plays extremely long from the tips at 7291 yards and a well-deserved slope of 144. At that length, just about every part of your game gets put to the test -- because there are uphill shots, downhill shots, uneven lies, forced carries and some wetlands and water. Since the grow-in period is still in effect, the rough is brutal. 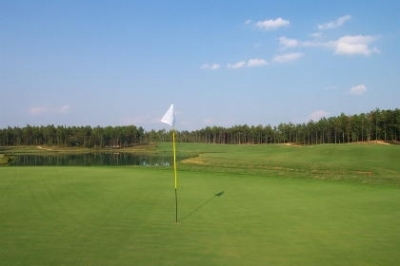 The putting surfaces are medium sized, but not overly undulating or tiered. And although the chipping areas will eventually look like Augusta, the greens won't roll at a Masters-like 14 on the stimpmeter. Despite the length, you'll have a hard time calling it unfair. Brickshire's General Manager, Erik Keyser, explains it this way: "A lot of the response we've been getting is that it's extremely long, but extremely fair. Some of those fairways out there have to be about a hundred yards wide, so you'll have a large margin for error with your long clubs -- you'll just have to use 'em a lot." Another uphill par three, the 13th hole will challenge with a variety of pin placements guarded by a large bunker in front. Clark says even though some holes play pretty long, there're also some opportunities on the layout for birdies. "If you take a look at the scorecard, you'll certainly notice the long holes. But you'll also see we've included a couple drivable par fours and a good portion of the other holes play shorter because they're downhill." He also suggests thinking about the course in a different way. "I told the owner -- it might be a good idea not to set par on this course," Clark adds. "How about just having a course rating and a slope, and let the people go out and try and make a score, without worrying about par. You're going to have some of those par fours rated at about 4.5, while others will play 3.5 -- so why not just let folks play the course without worrying about what's a bogey and what's a birdie?" Interesting concept. Certainly some of those par fours play like fives. There are three that exceed 470 yards in length -- and I'd think even Mr. Strange would have a tough time consistently making four on those. But Clark is right -- the shorter holes play quite a bit easier, so it's give and take. One thing's for sure -- fun is not compromised at any point. Looking back towards the tee on the 15th green, if you escape with par, you've done your best work. Very little about the layout will have you cursing at your clubs -- and if you lose a ball, chances are it's your fault -- there's nothing tricky or hidden about Brickshire. So grin and bear it. The round begins with the aforementioned first hole, set to play like #3 at Augusta. The view from the tee is panoramic -- the driving area couldn't be wider. 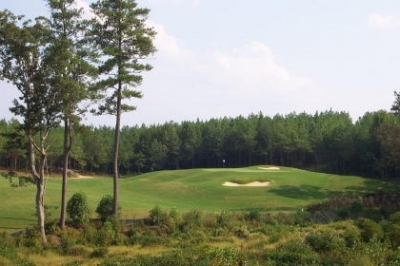 Clark says they're going to plant some pine trees down the left side to make it look more like the famous hole on the Georgia course, but even then, it'll still be very playable. The green on this hole is more sloped than most on the course, perhaps in reference to its famous mentor down south. Two and three introduce you to Brickshire's brutish length, playing 473 yards of par four and 594 yards of par five, respectively. There's nothing easy about #2, other than it's straightforward and has a wide landing area. Three plays downhill after the tee shot, but I doubt many will try getting there in two. The 18th hole presents a reasonable birdie try, should you reach the putting surface without finding the water. Four is the first of an excellent set of par threes, playing 213 yards, uphill, and often into a breeze. This is one hole where some cut-down areas around the green would really benefit your scorecard. Five is what Keyser says is the most 'unfair' hole on the course. I don't really think he means 'unfair' as much as he means 'incredibly hard,' because there's nothing hidden about it -- it's just long and uphill. The lengthiest par four on the course, it's 478 yards, and the tee shot's from an elevated tee over a waste area to a fairway that slopes left to right. Even with a mashed tee shot, you'll still face over 200 yards to the green. Quite a mountain to climb, and take Clark's advice -- don't worry about par on this hole. Seven is the hole patterned after Pinehurst #2's eleventh hole, and features a very generous driving area (like you'd find at Pinehurst), with the challenge coming nearer the green. Five bunkers guard much of short and long, and the view is somewhat deceptive as to distance -- consult the yardage book. Brickshire prides itself on being very enviro-friendly. Here, it's not hard to see why. Photo Courtesy of Brickshire. Nine is a great par five, but you'd expect that -- since it's designed to play similar to St. Andrews' 14th. The hole could play several different ways -- try and cut off some distance by going straight at the green down the left side, but that'll bring more trouble into play; or go to the right and you're safe, but it'll play much longer. The 'Hell Bunker' may wreak havoc with your second shot here. Eleven is the great short par four, a replica of Riviera's #10 -- 307 yards. The tee shot presents plenty of options. Try and knock a driver on or close to the well-guarded green, or take the safer and much more forgiving play -- a long iron to the fat part of the fairway over a large bunker to the center-right, then a sand-wedge to the narrow green. Twelve's another nice par five, long at 618 yards and doglegs to the right. A lengthy test of shot making, plan out the distances for your three shots, and try to play the hole for five -- I bet you'll leave satisfied. Fifteen's the type of hole you won't see very often. A monster 244 yard par three that plays uphill and often into the wind. It's also the #2 handicap hole on the course -- how many times have you seen a par three rated the toughest hole in a nine-hole stretch? This one deserves it. Seventeen's the last par four on the course, and a doozy at 475 yards. It does play downhill, and the driving area's wide, but don't lose the ball to the right, or there're wetlands waiting for you. At least there's one thing you won't worry about on this hole -- sand. There isn't a single bunker on the hole. Eighteen is the only hole on the course with a sizeable body of water to contend with -- a lake that flirts with the entire right side. Definitely a risk-reward three shotter, as you can stay safe down the left side, but you'll go longer that way. I don't really see it as a possibility in two -- 568 yards long and a good deal of the landing area off the tee will leave a downhill lie -- but if you've got a favorable wind, go for it! Upon finishing, you can't help but think the Brickshire folks have a solid foundation for success -- now, and in the future. Stop by and build on it. Twilight rate: $29 - $39, after 2:00 p.m.